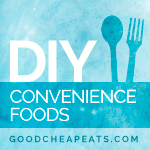 This post is part of the DIY Convenience Foods series where we’re unpacking those fun foods that we just grab at the store or fast food restaurant. We’re making them cheaper or healthier — or both. When my sisters and I were young, my mom was always very gracious with her kitchen. It was never any problem for us to go cook or bake something. We were expected to clean up our mess, but Mom was pretty lenient even in that regard. During junior high or high school, my sister Jamie and I started making flautas, based on a recipe we found in a magazine. The original contained cooked chicken, shredded cheddar, and prepared-picante-sauce-not-from-New-York-City. The filling was rolled into fried corn tortillas and baked in the oven. We loved them. And made them often. However, since my husband doesn’t love prepared-picante-sauce-not-from-New-York-City and I think it’s too expensive to pay for, I’ve created this version that is better for us and just as tasty. These look like taquitos, don’t they? I always thought that taquitos were made from corn tortillas and flautas from flour. But, The Food Lover’s Companion has no listing whatsoever for taquito, and instead defines flauta as the corn tortilla rolled around a savory filling and fried. Wikipedia disagrees somewhat. For argument’s sake, I’m calling these flautas. Preparing the dish, whatever you want to call it, is not difficult. Soften corn tortillas in hot oil, fill them with a mixture of cooked chicken, shredded cheese, and spices. Bake in the oven and serve. Super yum. You can freeze them on a lined tray prior to baking or cool baked ones and freeze those. Either way, you’ve got convenience at your fingertips. I used a pound of chicken (1.99); 2 cups of cheese ($1.00); 18 tortillas ($1.50) and some spices and oil ($0.25 tops) making these for $4.74/batch or about $0.26 each. While mine aren’t a ton cheaper than the commercially made frozen ones, I would submit that mine are tastier and healthier for you. Don’t you think? I used boneless, skinless chicken, Tillamook sharp cheese, Mission tortillas, and sunflower oil. I’m convinced that these were better quality for the money, the biggest bang for your buck. That’s kinda how I roll. Preheat the oven to 475°. Spray a baking sheet with nonstick cooking spray. In a large skillet, heat the oil until shimmering. Add the chicken and cook, stirring, over high heat. Once the meat starts to whiten, add the chile powder, garlic powder, salt, oregano, and pepper. Cook until the chicken is cooked through. Remove the chicken to a cutting board and chop fine. Cool slightly. In a large mixing bowl, combine the chicken and cheese. Adjust seasonings. In a small skillet, heat about 1/2 inch of oil. Fry the tortillas in the oil until hot and softened. Transfer to the prepared tray. Roll a scant 1/4 cup filing into the middle of each tortilla. Roll tightly and secure with a toothpick. Bake for 10 minutes, turn the flautas. Bake another 10 minutes. Serve hot. Cooled flautas can be frozen after baking. Alternatively, you can freeeze them unbaked. 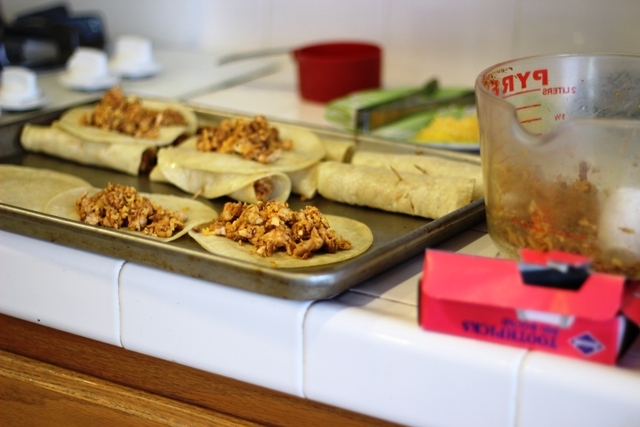 Once they are all rolled, place the flautas on a lined baking sheet and place in the freezer until the flautas are hard. Remove the toothpicks and store the frozen flautas in a ziptop freezer bag. Do not thaw before baking. 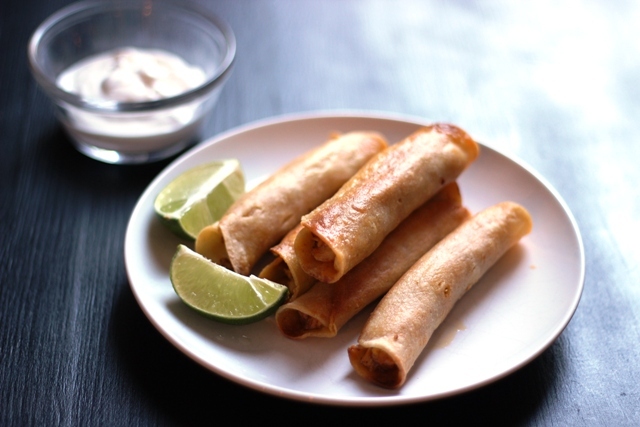 Place flautas on a tray and bake as directed. Increase baking time if necessary to accommodate for frozen flautas. Want to make more? Try these Beef Taquitos. I’ve been following your blog for a while now, and I really appreciate how you show that good, healthy food doesn’t have to be expensive or difficult to make. 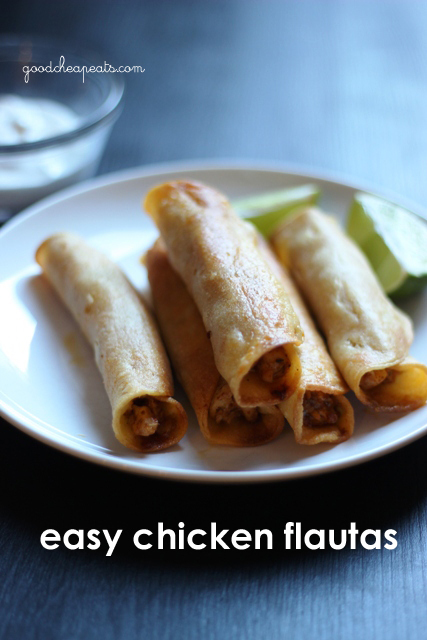 These chicken flautas will now be part of my meal plans. Thank you. Thanks for sharing this.. I like eating them but I’ve never made them.. looking forward to it! What a great addition to our Taco Tuesday rotation. I am sure these would be great made with any leftover carnitas or shredded beef as well? I love recipes that you can use up what you have! Thanks Jessica! I have some left over spicy pulled pork that I’m going to use for this !!!! Yummo!!!! Oh goodness. I think every time I go shopping, I pick up a box of these… and put it right back into the freezer from whence it came. Thanks so much for the recipe. These will be a hit around here. Meat, corn tortillas, cheese…. always a winner. These have been on my to do list for a long time! Lol. Maybe now I will get to them?? Ya never know. Even if they cost more than store bought, I wouldn’t mind at all. They wont have any unknown ingredients. That is worth every penny. I agree with you on the definition of taquitos and flautas…but whatever we call them, I’m going to make these this weekend! Or for tomorrow night’s dinner! Tried these tonight, they were a little more work than I had planned for, but totally worth it. The husband already requested them for next week. Delicious! Yeah, they are a bit of work, that’s why it’s good to make a lot at one time. Just out of curiosity though, I know you mentioned the corn versus flour tortillas – would they be ok being made with flour tortillas instead? That’s usually what we buy around here, but I would get corn if you don’t think flour would work. I don’t know about baking times, but yes. Flour tortillas are really tasty in these. I make these often. A black bean/cream cheese/cilantro filling is also delicious. Ooh, cream cheese sounds like a very yummy filling! Frying them in the oil allows them to roll without tearing. Oh, and the recipe says 14 teaspoon pepper. I’m sure you meant 1/4 t., but I thought I’d tell you. Good catch. I hope no one made it with 14 teaspoons pepper! Oh my! My sister says you can, but I never have. She uses tongs and just turns them in the hot oil. Leave out the cheese, though. I have always fried these (with the cheese) and they come out fine but oh my, this way is faster, easier and crispier! Thanks for a great recipe!! My husband and I made these together tonight. It was a lot of fun after the kids went to bed! 🙂 However, I turned the oven to 475 like the directions say, but after the first 9 minutes the edges of the tortillas had already turned dark brown. We didn’t even attempt to put them back in for the second 10 minutes. Did we maybe fry the tortillas too much before the oven? That is possible. I’m glad you were watching. What kind of oil did you use? Instead of frying your tortilla. You could heat your tortilla up in a microwave then roll them. When heating them up in your microwave wrap them up with a damp towl or put then a container so they don’t dry out. I usually will do about 1/4 of the bag at a time. Heat 1min. Then flip and do another min. They will be hot. But you can roll them and they will not tear. Works on both corn and flour tortilla. This strategy works well for enchiladas, but I’m not sure it would work for the flautas since the oil helps them crisp up when you bake them. The way you make flautas is the same way you make enchiladas. The only real difference is the sauce process. At least that’s how my nana and my mom taught me to make them. I’ve never tried baking them in the oven. I’m definitely going to try it because it has to be way better than pan frying it the whole way. Baking is never as good as frying the whole way, but it’s definitely easier!